Semtech Corporation (Nasdaq: SMTC), a leading supplier of high performance analog and mixed-signal semiconductors and advanced algorithms, announced that Quantified Ag, a company specializing in Internet of Things (IoT) cattle tracking and cattle health solutions, has implemented Semtech’s LoRa® devices and wireless radio frequency technology (LoRa Technology) into its smart cattle tags for advanced health monitoring. Quantified Ag’s devices are implemented in feedlots in the U.S. and Australia. 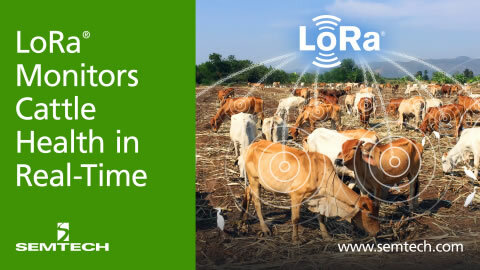 Quantified Ag’s LoRa-based hardware collects data continuously – 24 hours a day, every day – allowing feedlot workers to detect and respond to anomalies in a cow’s behavior and vitals. Each sensor measures body temperature and activity, and the data is sent to the Cloud for analysis in real-time or stored for trend reports. Applications scan the data for outliers such as a cow showing reduced mobility or elevated body temperature, which could be signs of disease. Feedlot workers are then notified of the anomaly, and can act quickly to prevent disease from worsening or spreading.